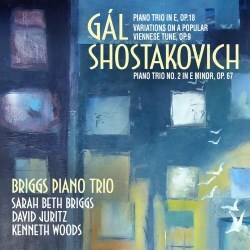 The Briggs Piano Trio were brought together by Avie Records to make this recording, which contrasts Gál’s poetic E Major Trio which Shostakovich’s dark E Minor Trio. All three musicians share a commitment to raise the profile of Hans Gál and Sarah Briggs has recorded the Gál Piano Concerto under the baton of Kenneth Woods to wide critical acclaim. Gál’s E Major Piano Trio dates from 1923, a few years after he had been appointed lecturer at the University of Vienna. Gál’s music was in the ascendant at the time although, like many others in this post-War period, his financial situation was precarious. The E Major Piano Trio is a highly inventive and lyrical work with long melodies and post-Romantic harmonies. The Briggs Trio do a terrific job in introducing this unfairly neglected work to the public. The opening movement reminded me of Brahms’ chamber music with its rich textures but there were also echoes of Strauss with its Romantic surges and fin de siècle Viennese nostalgia. However, Gál is very much his own man with highly unusual harmonies and an intriguing range of textures. The Briggs Trio bring savage bite to the second movement scherzo (which is marked violento), while the trio section is a sweet melody shared between the strings accompanied by delicate arabesques on the piano. The finale starts with a sombre introduction on the violin followed by a more animated section. This serves as an extended introduction before the main Allegro section, which is capricious and mercurial in character. The tempo gets faster and faster as the movement progresses, before the Briggs Trio bring the movement to a conclusion with a dazzling virtuoso display. I am delighted this work has finally seen the light of day – one can only hope that this wonderful performance by the Briggs Trio will lead to its incorporation into the mainstream repertoire. The Heurigenmelodie (or wine-house melody) Variations were written in 1914, just before the start of the First World War, but they were not published until after the war when they became extremely popular. The jaunty theme is introduced by all three instrumentalists in turn before they embark on the increasingly elaborate variations. The Briggs Trio play with carefree swagger and an infectious sense of joie de vivre and one cannot fail but to be won over by this performance. It would be a great encore piece and, if performed like this, would bring the house down. The final work on this recording is Shostakovich’s magisterial E Minor Piano Trio, which was written in 1944 in response to the death of Ivan Sollertinsky, a polymath and close friend to the composer. Shostakovich was at this time deeply affected by the news of Hitler’s death camps which was beginning to leak out to the outside world. His E Minor Trio uses Jewish themes, the most famous of which is in the finale, and it is a great cry against anti-Semitism. This recording by the Briggs Trio is one of the best I have heard of this seminal work. Juritz and Woods do an excellent job with the eerie whispered harmonics which open the first movement. The ensuing canonic entries are adeptly handled and the music allowed to build in a deeply unsettling way. There is tight interplay between all three players in the dazzling scherzo. The string players bring bite to this savage dance while Sarah Briggs keeps the rapid passagework taut and clean. The movement has a grotesquely surreal feel, as if we are witnessing a hedonistic party spinning out of control. In the Largo third movement, Sarah Briggs’ sombre chords evoke a bleak and desolate mood. The strings evoke the sounds of lamentation and mourning in their elegiac exchanges. This profoundly moving prayer for the dead is realised vividly here and brings us into the heart of this great work. Pizzicato strings lead us into the ‘Dance of death’ finale where the sense of parody and the grotesque are overwhelming. All three players approach this movement in an unbridled way to create a vast macabre distortion before the music subsides one final time. This is an inspirational performance of one of the greatest chamber music works of the 20th Century. Overall, this is outstanding playing by the Briggs Trio and this recording is recommended without reservation.